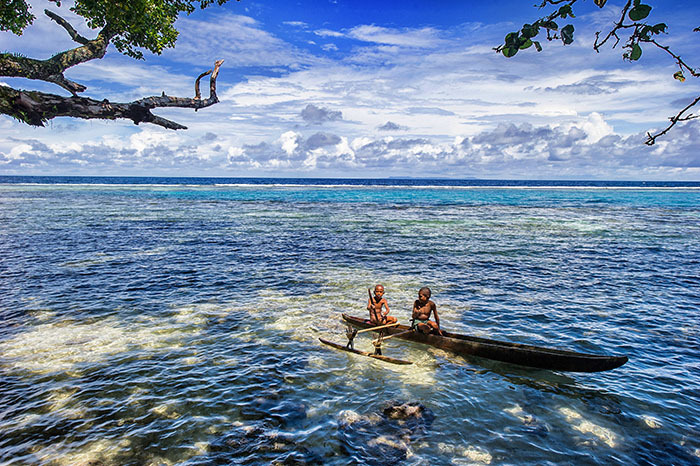 Picture by Brian Cassey showing boys fishing in the islands, Manus. When the Australian government announced it would make Manus Island, Papua New Guinea, as its third island prison for asylum seekers, I was appalled. I had always been on the side of refugees and issues concerning their safety. However, for using this peaceful small group of islands as a prison was something I felt strongly about. The Regional Resettlement Arrangement (RRA) goes further than the Pacific Solution introduced by Julia Gillard in August 2012. It was referred to as the PNG Solution. Mid 2013, Australia announced it will no longer process any refugees arriving by boat. For me, the Manus decision not only showed a rich and powerful country bailing out of its problems, but using, and forcing a weaker and poorer nation to take on these problems. The decision was against human rights at many levels. I also felt that PNG was still being treated as an Australian state and the PNG government seemed to be too eager and voice-less somewhat, in allowing the asylum seeker policy decision to proceed. The other reason for voicing my concern was that the Manus people were never consulted over accepting the refugees on their land. Given they are tribal people, I was surprised that PNG government had not thoroughly considered this, nor chosen another land, perhaps somewhere on the mainland location for the detention centre. That remains a puzzle – why did PNG government choose Manus? Land is the most important asset in the Melanesian culture. For generations, lives were lost in PNG constantly over land disputes. Further to these concerns, bringing into and pre-settling the refugees would not only have long-term effects on land ownership but it disrupt the Manusians cultural dynamics. I do not mean this in a racist way. Melanesians kill each other over land, regardless of who they are. I believe that Australia is rich enough and has enough place to facilitate genuine refugees seeking asylum. I had joined demonstrators in Brisbane City. Hundreds of people from all over the world took to Brisbane’s main George street to show their anger and frustrations at the Australian government’s treatment of the refugees and that decision to use Manus as the next prison. As time passed, it seemed that no-one paid any attention to the nation-wide public outcry nor the media reports in both countries. The Australian government’s asylum seeker policy was enforced, with the first group of refugees being moved to Manus Island soon after. 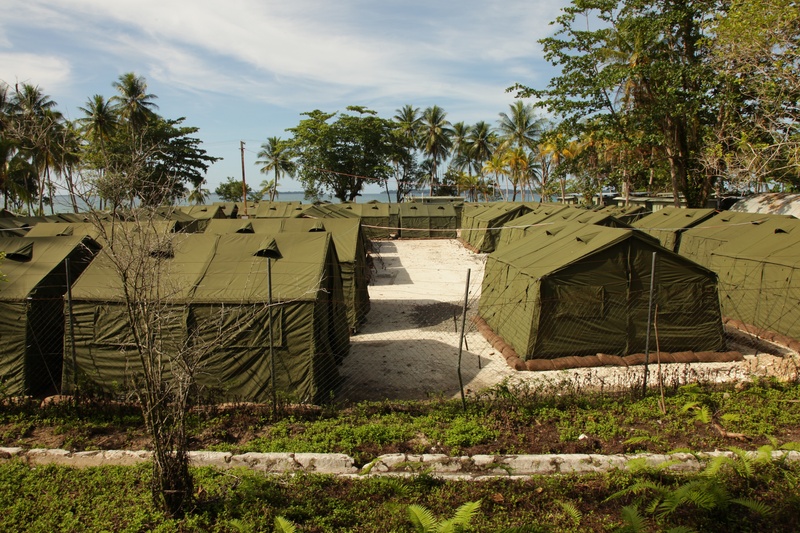 Picture: Wikipedia – The Manus detention centre. Things have not been going as planned in Manus. Within the confinements, refugees have suffered appalling conditions. Recent media reports showed clashes between refugees and PNG securities resulting in death and now, the latest claims are that the islanders will not accept the refugees to be re-settled in Manus and PNG. Settling into a foreign land is an issue world-wide and there are reasons for people becoming refugees, however, in my opinion, governments have to take more and careful considerations of parties involved, as in the case of Manus Island detention centre. Politicians cannot just sign-off on policies without consultation with the people; the costs are always high for those decisions they make. This part of the post is merely my opinion. I found two related stories about the Manus asylum-seeker decision which I wish to share. The two articles give different perspectives to this story. There are not too many articles on the views of the Manus people. The Oral history of Manus and the migration of its original people could be another story. The second article shown on a link below was published in the Australian Museum blog a year ago. This story offers a history of the origins of Manus. Here is the first story. The other is on the link at the end of the post. The 60,000 people of Manus province, a remote island outpost of Papua New Guinea, had no say in the decision by Australian and local leaders to detain, process and at least temporarily resettle foreign asylum seekers on their shores. “We heard about it on the radio,” says Nahau Rooney, a pioneering political leader, former PNG justice minister and Manus’ most famous daughter. In the 14 months since Australia’s “PNG solution” was brokered, sending asylum seekers trying to reach Australia by boat to Manus for processing and eventual resettlement in PNG, the operation has also sent a tsunami of change crashing through every dimension of island life. It has delivered a booming economy, jobs and desperately needed services. It has also brought social and environmental damage, deaths, dislocation, disputes and deep anxiety about what will come next. What is certain is that life in Manus will never be the same. Any day now the first 10 recognised refugees are expected to move out of detention and into the $137m village Australia has built for them in Lorengau, the provincial capital. More refugees are expected to follow each week. Here they will live freely, but many are deeply anxious about how they will be received and fear for their lives. Manusians are famously welcoming, but some are resentful about the uninvited arrival of these new neighbours; some are nervous and have little information to quell their concerns; and many worry about the strain they will place on the island’s limited jobs and services. This exclusive investigation for Guardian Australia explores from the ground the consequences, good and ill, of Australia’s asylum seeker policy on the land, sea and people of Manus. Thank you very much for sharing your thoughts Christoph. I really appreciate you reading. Thank you Ati for commenting. It is hard to think of it in any other way, is there? This is an exhaustive post about a subject you evidently feel very strongly about. Thank you for presenting this subject, Joycelin, and sharing some of your own opinions about it. I can fully understand your concern. Yes, it was. I’m glad you can see my dilemma Millie. This is going to be a big problem in the years ahead. Thank you for reading, it means a lot to me.